What is now called Drelliad village was established decades ago as the private retreat of Ord Mantell's most celebrated smuggler, the voluptuous and quick-witted Ulla Drelliad. In the years after Ulla's death, her hideaway was transformed into a thriving trading post. Now, Drelliad village is hotly contested territory where separatist and Republic forces battle in the streets, and the handful of civilians who haven't already fled hide in basements and behind locked doors. Although small, Drelliad village occupies a critical point between separatist-controlled territory and areas still loyal to the Republic. More importantly, what used to be Ulla's personal docking bay is now one of the only starship landing pads outside of local Republic headquarters. If Drelliad village falls entirely to the separatists, it will bring the enemy one step closer to securing the entire island. The area now called Fort Garnik began as a series of makeshift landing pads built on the island of Avilatan for spacers who were too disreputable for the mainland. Avilatan was a haven for gangsters, smugglers and pirates, but was also one of the largest and most thriving economies on Ord Mantell. Settlements formed, and over decades, Avilatan became respected as a major commerce center. 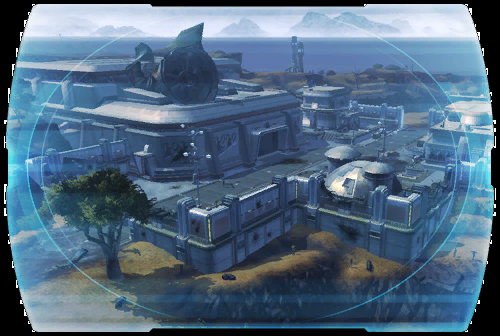 When separatist bombings destroyed Ord Mantell's other spaceports, Avilatan became the Republic military's primary staging area, and its now-substantial landing zone took on strategic importance. Renaming the Avilatan spaceport to "Fort Garnik" in honor of a Republic war hero from Ord Mantell, the military established a fortified garrison there. Since then, Avilatan Island and Fort Garnik have become major targets of the separatist forces. Mannett Point was originally founded by Ord Mantellian pirates as an underground vault for their ill-gotten gains. As their criminal haven became respectable, the pirates were eventually replaced by "businessmen" who converted the subterranean warehouses into a freight shipping center. Goods that landed at Fort Garnik were sorted at Mannett Point and then distributed across Ord Mantell. After the establishment of Fort Garnik, the Republic military continued using Mannett Point to store munitions and war materiel. This would prove to be a fatal mistake. Separatists staged a daring midnight raid that destroyed the bridge between Mannett Point and Fort Garnik, cutting off reinforcements. Separatist commandos swarmed Mannett Point under cover of darkness, using the chaos from the bridge's destruction to infiltrate the warehouses. The separatists quickly slaughtered the Republic defenders to a man. By dawn, Mannett Point was a separatist stronghold--giving the Republic's enemy a major storehouse of weapons and supplies to continue besieging Fort Garnik. In contrast to the working-class origins of Talloran village, Oradam was a beachfront paradise for wealthy trader-barons and their families. These men and women spent their profits constructing elaborate homes and relaxing by the sea. Their freely flowing credits attracted numerous merchants and artisans to Oradam, many of whom remained long after their wealthy patrons fled. Oradam is the last uncontested Republic village on the island of Avilatan, partially because it holds very little strategic significance. Its importance to the separatists is mostly symbolic. Republic strategists theorize that if the encroaching separatists were to successfully invade Oradam, the enemy would most likely burn the village to the ground as a way of spiting the corrupt upper class. The thin sliver of beach colloquially referred to as "Savrip Island" derives its name from the hulking brutish creatures infesting it. For whatever reason, the savrips inhabiting the islet rarely stray from its borders--but on the other hand, they do not appreciate uninvited guests. Beachcombers have disappeared in this deadly region for decades. Local legends tell of a clever crime lord named "Frang the Toothless" who negotiated a deal with the savrips. In return for Frang being allowed to dump his enemies on Savrip Island, the gangster promised to provide the natives with a steady food supply. It is said both sides benefited tremendously from this arrangement. The separatist command center closest to Fort Garnik was originally thought to be Mannett Point, but Republic intelligence operatives recently discovered that the main separatist force occupies the island's still-active volcano. This position gives the separatists multiple access points to the island's settlements, as well as a predator's eye view of Fort Garnik itself. Sources indicate the volcano base originally belonged to a notorious gangster known only as "the Corellian" who disappeared in the civil war's early years. Whether the Corellian joined the separatists or gave them his volcano base under duress is anyone's guess. Regardless, taking out the separatist stronghold has proven almost impossible. Any attack on foot exposes the invading force to withering counterattacks and heavy casualties, but artillery strikes on the volcano risk flooding the entire island with lava. One of the few settlements around Fort Garnik not originally founded by criminals, Talloran village began as home to the laborers and their families who toiled in the island's starship ports and shipping warehouses. The people of Talloran were hardworking, mostly poor and easily exploited by the corrupt businessmen in charge of Ord Mantell's government.